You are here: Home » MEDIA » Books » You Can Act On Camera by D.W. Brown (book review). You Can Act On Camera by D.W. Brown (book review). 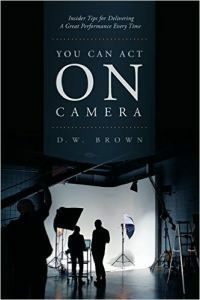 In many respects, D.W. Brown’s book, ‘You Can Act On Camera’, could be seen as an insight into how actors psyche themselves up for their roles, irrespective of the acting technique they employ. It is also useful for directors to ensure the environment is right for the emotion that needs to be used and a sharp lesson for other production staff to know when to keep quiet after a performance. I think one important thing I learnt from this book is the need for many actors to have their quiet moments and/or rituals they go through for preparation because it allows them to remove any inhibitions as to what they are about to do and stay focused. Brown only touches on the ‘method’ once but only in terms of finding the ‘truth’ of the character for a particular situation. What does make this book special is the multitude of mini-interviews that Brown conducts with various directors and actors as to stage environment and being ready to perform and should be an eye-opener for those of you who want to learn something from it. Something director Peter Bogdanovitch says that is extremely pertinent is that the actors should ignore the cameras and let the director choose how to film it. Director/actor Peter MacNicol also enforces this saying that actors should give as many good takes as they can to ensure that the film editor has enough choices to get the best cut. Equally, he puts in that actors should be entitled to do at least one take their own way before being given notes about changing anything. Director Greg Champion emphasises that actors need to keep the same emotional content for each take as well otherwise it becomes impossible for the editor to tie things together. Director Jerry Zucker relates how his ‘meaningful’ conversation of what he wanted when discussing a scene for ‘Ghost’ with Patrick Swayze became ‘faster and louder’ in terms of getting the dialogue across. Director John Patrick Shanley points out that as with theatre where the audience is a participant in the performance by the way they act, that the camera should be seen in a similar light. That one had me really thinking as to how readers should react to prose and writers really do need to convey emotional content into their writing which might explain why some of the novels I’ve read recently come over as a tad flat. I should point out that these are examples that I picked out. There is far more than that here and whether you’re an actor or director or just someone wanting to know about the acting profession, that you will learn a lot here. To end, there is a complete glossary of technical film terms in case you don’t know them. Considering the small page count, this book carries a big punch. « U.K Fantasy Paper Book Chart: May 2016, Week 2.